This two-day course looks at the achievements of the late Joseph Campbell in respect to his placing at the centre of the human condition the role of `mythological voices'. Among the numerous themes which occupied him over his lifetime was the great monomyth of the hero's journey and the importance of forging one's own path; the masks of deity enshrouding the various gods and goddesses found throughout the world, forming a bridge between East and West; and the need to `follow your bliss' in order to achieve a fulfilled life. His work infused a range of artistic expression including George Lucas's Star Wars franchise and the Grateful Dead rock band. His formative influences included H. Zimmer, A. Bastian, his students and his wife, the dancer Jean Erdman. We look at the role of mythology in both reflecting and instructing humanity and the relevance of Campbell in developing this perspective. In analysing the similarities between myths we discover the archetypal significance of the `masks of God'. The course explores the various dilemmas of the modern world as identified by Campbell and his solutions, including the value of having a mythic awareness for today and the need for a new (ideally, global) mythology to replace the decline of key meta-narratives over the past century. Ken said that if you can only attend one session then it is still worthwhile as the essence of Campbell's thinking is not too hard to grasp and any missed day can be compensated for by relevant handouts. 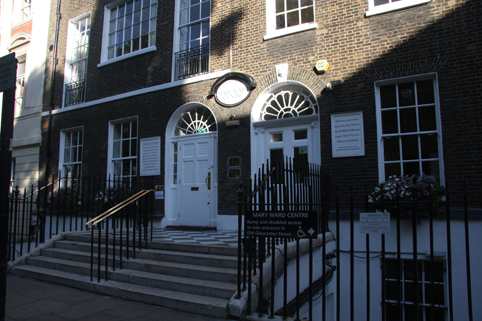 The classes will run at the Mary Ward Centre (pictured right), Queen Square, London WC1 on Saturday 25 November and Saturday 2 December from 10.30am to 5.30pm. Fees are £54 or concessions. For enquiries, call 020 8671 6372 or email kenrees@talktalk.net. For enrolment by credit/debit card call 020 7269 6000 or book online via www.marywardcentre.ac.uk. It is course no. 443. You can view The Hero with A Thousand Faces, The Collected Works of Joseph Campbell, on Amazon.